The Amethyst on the Right Has Faded to a Boring Color. Cracking, Chipping and Fading. Did You Know About the Risks of certain gemstone choices for your wedding rings? Some gemstones seemingly have no business in wedding rings. Some crack too easily and others are too soft. It seems as if some gems scratch with the swipe of a fingernail. Or they practically chip by looking at them the wrong way. In this post I’ll name the forbidden wedding gemstones and tell you why they cause problems. Oh yeah, and I’ll tell you a bit about diamonds. 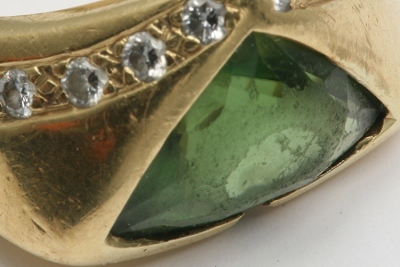 This Emerald Worn for Years is Chipped and Damaged. It Used to Look Nice. If there was a top three gemstones I’d prefer not to set in an engagement ring they would be emeralds, opals and tanzanites. Emeralds have many interior fissures that can weaken the gem and cause cracking. This would be ok if it wasn’t worn every day. Moving on, opals are notorious for cracking and splitting. They are delicate gemstones and not a good choice for daily wear. And tanzanites chip and scratch. 1. White Topaz, doesn’t sparkle as well as a diamond, light colored gems look bad when dirty and a ring worn daily gets dirty faster than you’ll clean it. People may see its color and think it is just an awful looking diamond. 2. White Sapphire, doesn’t sparkle like a diamond and ends up looking hazy. 3. Tanzanite cracks and chips, is heat sensitive and can shatter if shocked. 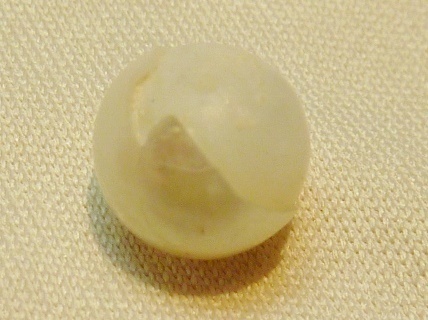 Pearls Can Scratch, Lose Their Luster, Or Lose Their Nacre Coating With Hard Daily Wear. 5. 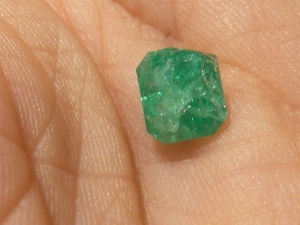 Emerald both cracks and chips and has natural fissures that can break apart. 6. Opal scratches, chips and cracks easily. It is also heat sensitive and solvent sensitive. 7. 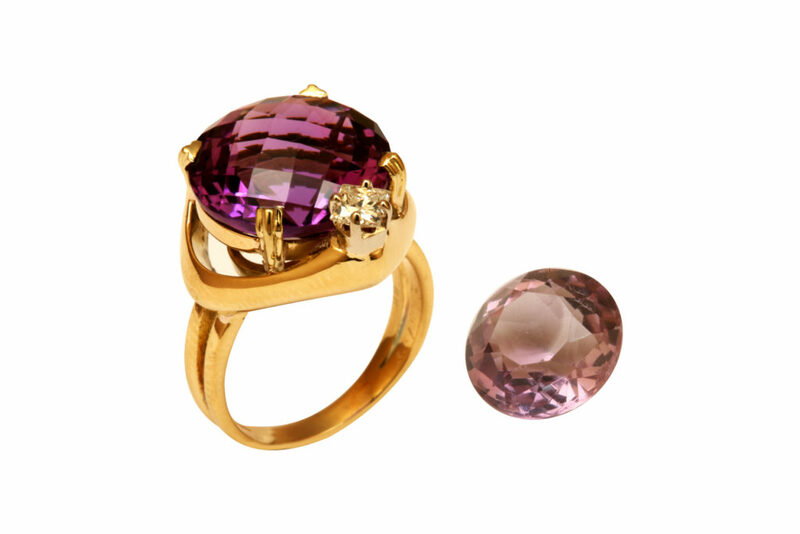 Amethyst is susceptible to scratches, the color can fade and it’s heat sensitive. 8. Peridot is a difficult color to pull off for many skin tones and it scratches. 9. Golden Citrine scratches and looks bad when dirty. 10. Pearl is delicate and scratches easily. It’s also chemical sensitive and relatively soft. 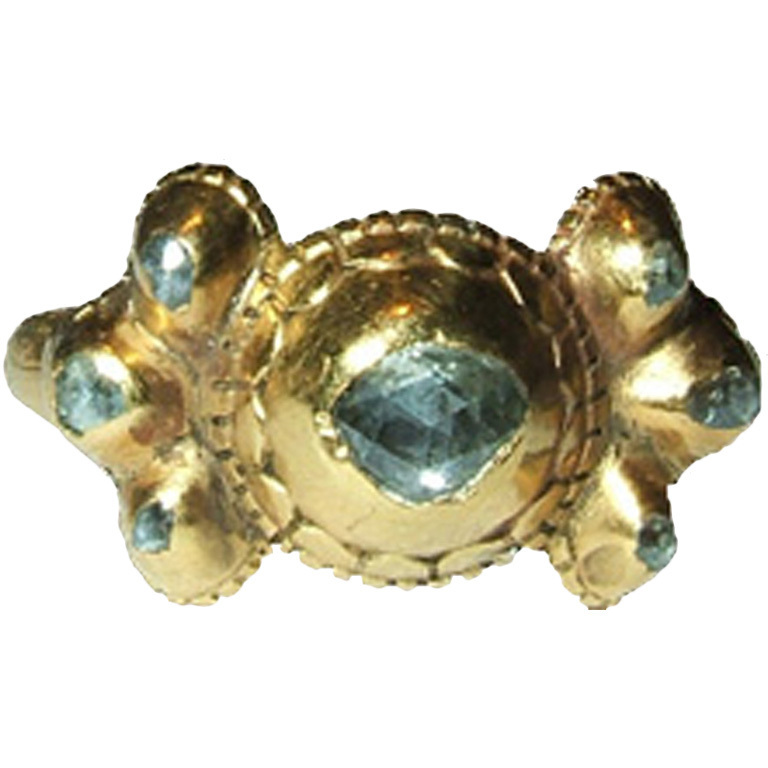 For more on your favorite gemstones and their care and sensitivities. Diamonds however are just the opposite. They’re hard, don’t scratch, and although they can chip (rarely) they hold up well to the rigors of everyday wear. This Diamond is Fifty Years Old. It Sparkles and Shines and Has No Blemishes. Sapphires and rubies rank just below diamonds on the Mohs Hardness Scale (a scale of gem hardnesses), and are also good choices for gemstones set in daily-wear rings. 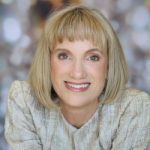 For more about diamonds, check my 4-C’s of diamonds series, starting with Shopping for Diamond Clarity. Fabulous and Gorgeous, Cars and Colored Gemstones. Do You Love Them Less Because They Need More Maintenence? On the other hand, I also subscribe to the philosophy that you should wear what you want to wear. 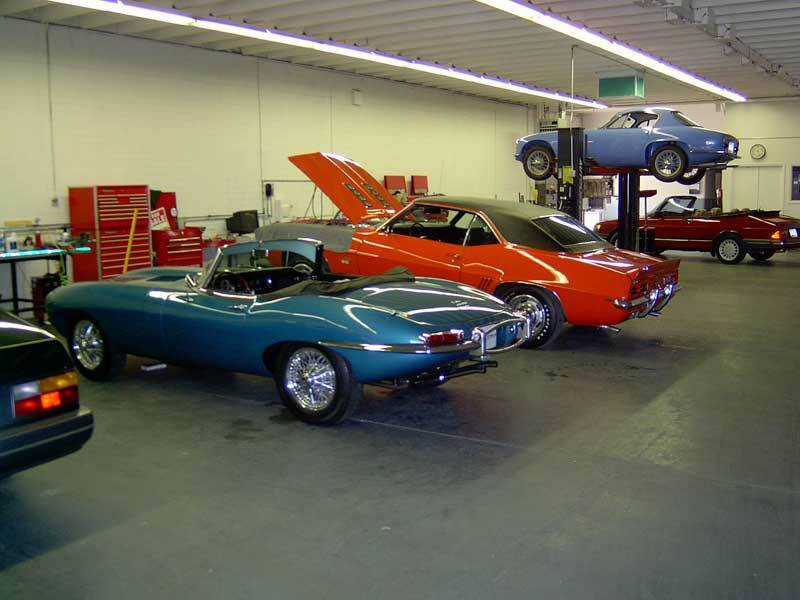 Just because you know your beloved classic Jaguar is going to need a lot more mechanical work than a Honda, is no reason you shouldn’t love it and drive it. It is after all your choice. It’s the same with gemstones. Just because a particular gem is not as strong as a diamond—and more than likely will have to be replaced sometime in the future—is no reason not to wear it. If opals rock your world, I say go for it. If the green hue of a emerald is your “power” color then by all means don’t let me stop you from setting one in your wedding ring. Just let us discuss the safest setting option and not just put it up there in four prongs to be dinged from the get go. Aquamarine Wedding Ring From Long Ago. But wait! Don’t diamonds represent the union between a man and a woman? Aren’t diamonds the go-to wedding gemstone? Well…yes and no. It’s actually only been recently that diamonds came to symbolize marriage. In fact, it was the famous diamond conglomerate, DeBeers that popularized diamonds for wedding rings. Prior to that, wedding rings were set with rubies, sapphires and other colored gemstones. 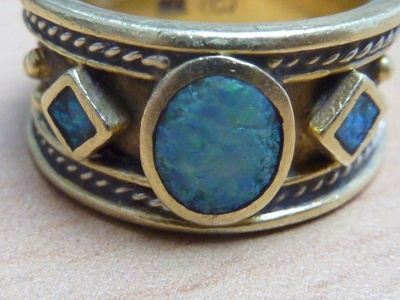 Elaine’s Opals Ring After Seven Years. It Still Looked Good Though it Needed Help. Seven years ago my client Elaine was ready for a new wedding ring. This time she wanted what she wanted regardless of the difficulty of her choice. She wanted an opal wedding ring. Rather than try to talk her out of it, I made sure she knew that, like our kids, an opal owns you; You care for it, as opposed to it serving you. You maintain it, sometimes throw money at it and otherwise play in its sandbox because it is the boss. Did I really say that about kids? I exaggerate, except the part about throwing money away and being at their beck and call, a lot. Seriously, I love being a mom. Elaine’s Ring After Seven Year Maintenence. We Cut and Inlaid New Opal pieces and it Looks Fantastic. 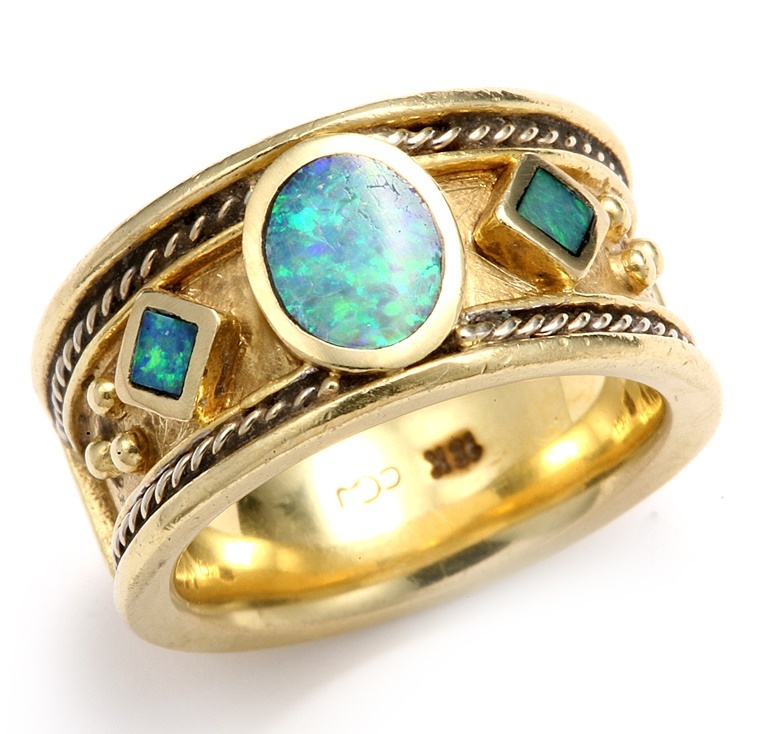 Elaine was ready for the task of being the mom of an opal ring. I explained the setting options she had to get the most protection for her opals. She chose the Etruscan style I offered. 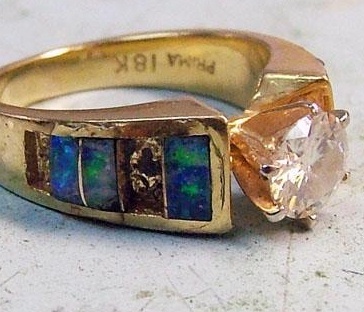 Amazingly enough she wore it daily for seven years before she needed to have a new opal piece cut. I told her I’d expected to hear from her within three years. I was really impressed with her care of her ring and those opals! 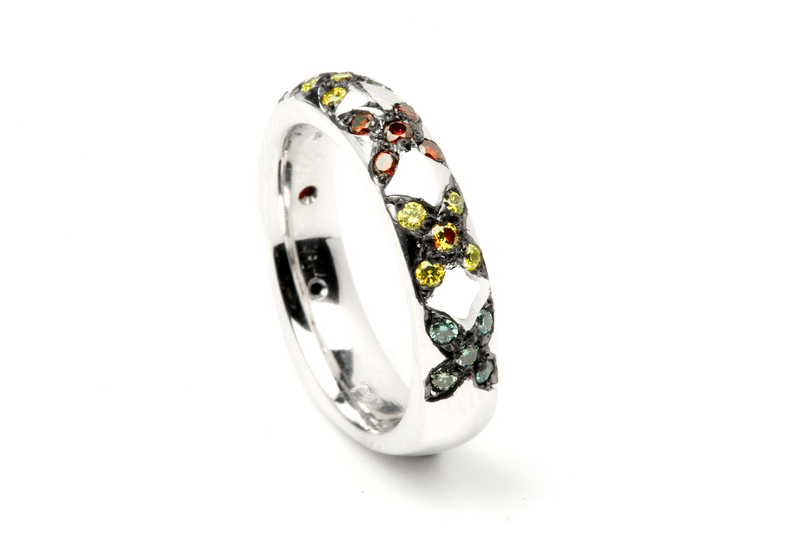 How Forbidden are the Forbidden Wedding Ring Gemstones? So…forbidden gemstones in wedding rings? Are there such things? Not really. If you’re the kind of girl that likes a bit of color around your finger, and won’t mind having to re-polish or replace a less-than-super-hard-and-indestructible center stone sometime in the future, don’t let me talk you out of it. The Chosen Birthstones Were Too Fragile For a Wedding Band, so We Used Colored Diamonds to Represent the Birthstones Needed. Let me inform you about any stronger gem alternatives for the colored gem you have your heart set on for your ring. Then you can choose your gem as well as your color with no surprises down the line. Once you know what to expect, and are cool with that I say: Go for it! Now I know why they say “diamonds are forever”!! Thanks for this great information about how to pick the appropriate gem for the ring based on its durability and sustainability. More great information from the best personal jeweler in the world! Congratulations Calla Gold on your 200th blog post! Your dedication to your work and blog are incredible, and so is your knowledge about different gems. I always learn something new when I read your blog posts, and I especially love the little bits of humor and personality you throw into them. PS I really liked your classic cars and forbidden gemstones analogy. Great way to think about it. Happy 200th Blog Post, Calla!! That’s quite an achievement! This wedding gemstone article is so packed with information, about all the “whys and wherefores” of picking out the “right” stone for a wedding ring. I love that you are willing to be as flexible as your clients want to be, while at the same time being sure they know the positives and negatives of each choice. I love the pictures of what happens to fragile gemstones. All the talk in the world doesn’t have the impact of those images. I’ve learned so much from your blog, thank you! 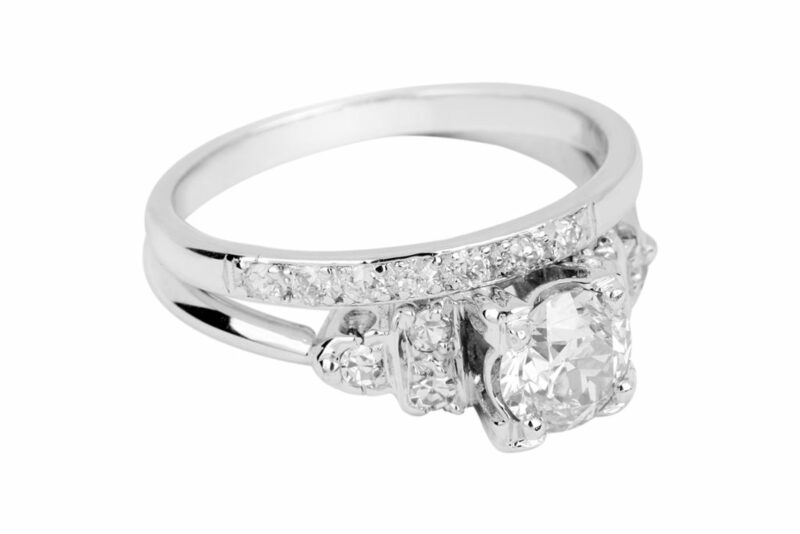 What are your thoughts on zircon for a daily wear/wedding ring? I just love the color of blue zircons, and their sparkle, but I’m worried it won’t hold up over time. 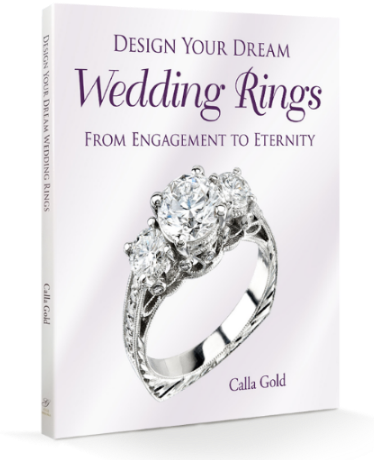 Love the topics on your blog Calla Gold, especially this one! I’m actually planning to get an anniversary ring and was thinking of getting a morganite ring. I love the blush color of the stone but am concerned how it will hold out as a daily wear ring. Appreciate your advice on this. Thank you so much for this post Calla! It is SO useful (but then again so are all of the posts on your blog…) Can I ask your opinion on black onyx for the centre stone of a ring? I want something a little more unique for my engagement ring and I love the colour black but I’m unsure of whether onyx will be strong enough to not chip etc? I didn’t see aquamarine on your list… any thoughts on its durability when used as a daily wear ring? I’d love to see one on my finger!